Are you afraid people are noticing you’re yellowish, grayish, stained or discolored teeth when you smile? Dental veneers may just be the answer to restore your smile. Also called porcelain veneers, these wafer-thin, tooth-colored shells are bonded to the front surface of the teeth to improve their appearance. The veneers procedure does not only give you white and shiny teeth, it also helps change the shape, size, and length of your teeth. Why may you need to receive porcelain veneers? Stained or discolored so severely no amount of brushing can whiten them. So big or long they are a constant source of embarrassment. Worn down, chipped or broken. Have large gaps between them. What are the benefits of receiving dental veneers? They will improve your teeth’s appearance and shape. They do not get stained even after many years of use. Porcelain veneers can be made to match the colors of the adjacent teeth. The affected teeth do not require as much reshaping as dental crowns. Veneers are affordable, yet strong and long-lasting. What does the dental veneers procedure involve? Examining the affected tooth and diagnosing the problem: On your first visit, we will examine the affected tooth and decide if dental veneers will be the appropriate solution. We may take X-rays and make impressions of your teeth and mouth. If we decide dental veneers are for you, we will discuss the procedure, as well as the pros and cons. 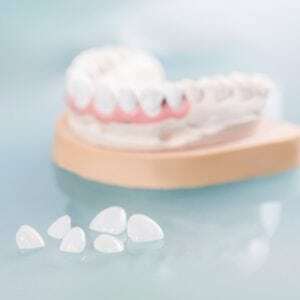 Preparing the affected tooth for dental veneers: At first, we will prepare the affected tooth for porcelain veneers by removing some enamel (about a half-millimeter) from the surface of the tooth. A local anesthetic will be administered to numb the area to help avoid any pain. Another impression will be made and sent to a dental laboratory with the specifications where porcelain veneers will be custom-made for you. The lab will take four to five weeks to construct the veneers. Protecting the teeth with temporary veneers: Before letting you go home, we can affix temporary veneers on the prepared teeth. Receiving the porcelain veneers: On the final visit, the temporary veneers will be removed and permanent porcelain veneers will be applied on the affected teeth. Before placing the veneers, we will numb the affected teeth and surrounding gum (using a local anesthetic) and clean, polish, and etch them. Etching roughens the tooth’s surface for a strong bonding. After placing the veneers, we may remove and trim them repeatedly to achieve a perfect fit. Once you are satisfied, we will bond the veneers to the teeth using a special cement. The entire veneers process can take between four to five weeks. Once the process is complete, your teeth will look natural and beautiful. Veneers are the best option for people who want to change the shape and appearance of their teeth without having to wear a dental crown. Feel great about your smile and get started. Are you ready to get started? Feel free to contact us to learn more. One of our courteous and happy technicians will be happy to assist you. You may reach us by phone at 212-509-4585 or through our contact form.